This has been an amazing spring semester. The Autistry families, including our new friends from Oak Hill School and Star Academy celebrated all the cool projects with a warm and wonderful Open House. These end-of-semester gatherings bring us together to share our work and admire the work of our fellow students. So much to share with you all. But first the big news: a generous donor has pledged $20,000 to Autistry. This is a matching 2:1 donation so for every $1 donated we receive an additional $2. These funds will go toward the launch of the Autistry Model Employment Program and the Opportunity Fund which supports sliding scale fees and scholarships. This is a great time to donate to Autistry – a lot of bang for the buck. Donations can be made online, on the Autistry Donate Page or sent to Autistry Studios, 37 Duffy Place, San Rafael, CA 94925. 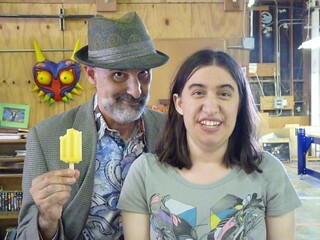 Last week Ken Pontac, writer and animator of childrens shows ToddWorld and LazyTown and the darker cartoon Happy Tree Friends visited Autistry. He regaled us with behind-the-scenes stories and shared his wisdom and experience of the world of animated storytelling. 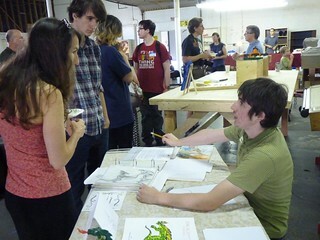 And the students shared their creations with Ken. It was a love fest and we hope he will visit again soon. 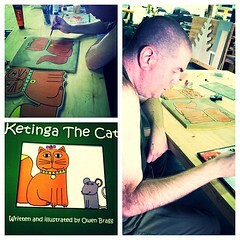 Owen’s book, Ketinga the Cat is now available on Amazon.com! Owen is on a roll. Birthday Surprise, his tale of a birthday party gone awry will appear on Amazon next. And then follows several more in the Ketinga series. 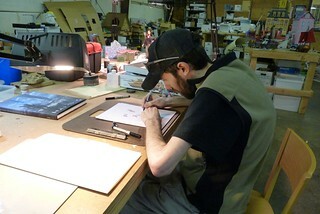 He is also working on the Ketinga Clock, perfect companion to the book, which will be available for purchase soon. 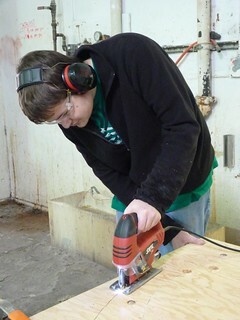 Rinny rocks the power tools. She made a beautiful napkin holder with a flower pattern engraving. This could be the prototype for new line of Autistry products. 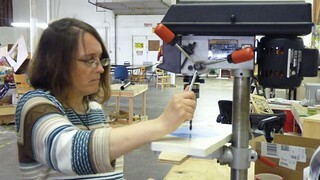 She is now working on a spice rack for the Autistry kitchen and she takes care of the new Autistry garden. 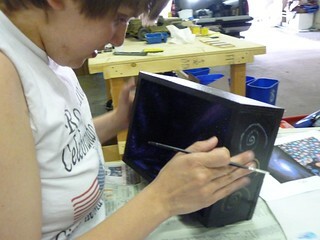 Julia has finished her stellar box lovingly decorated with galaxies, stars, and the Aurora Borealis. This has been a project of patience, detail, research, experiment and dedication. Julia made several tests to develop the application technique that gave her just the right look. A stunning piece! 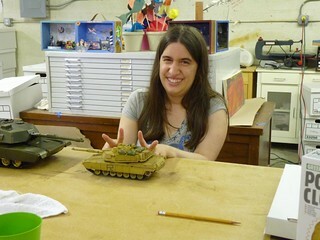 April, also known as Tank Girl, has completed four tank models – a US M3 Stuart, a Russian T-34/76 1943, a US M4A1 Sherman, a US M1 Abrams, and finally she’s currently building a WWII 6×6 cargo truck. April has created several different diorama environments – winter snow-scape, desert sands, and lush European hedges. Perfect homes for her tanks. Jon is working on the The Making of…. book for a film existing only in his wild and wonderful imagination. He has created a film poster and drawn several pages of illustrations documenting this imaginary world. Jon’s work is original, funny, and filled with twisted phrases and perfect descriptions of highly improbable realities. 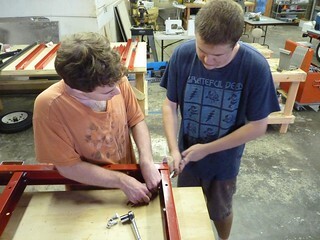 We are looking forward to a summer filled with new projects and the launch of the Autistry Model Employment Program. Stay tuned….